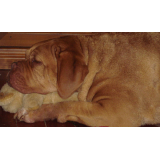 I live in country Australia with my large Dogue de Bordeaux. When a strange accident had the family lawyer suspicious, James Geraghty was brought in as a replacement bodyguard for the heiress Aden Barrington. What he didn’t expect was that the job not only entailed him being renamed and joining her menagerie of staff but that she would drag him all over the countryside while she drew trees. The association with James causes Aden to withdraw from her fantasy world to face the realities of life, except that hers consists of a cousin who might have organised her removal. James finds himself struggling to keep Aden safe while coping with her strange and deadly family. He would be far more confident if her eyes weren’t the colour of honey and her hair a halo of sunshine. James discovered he got much more than he bargained for when he accepted the job of being Mr. Smith because falling in love wasn’t part of the job description.